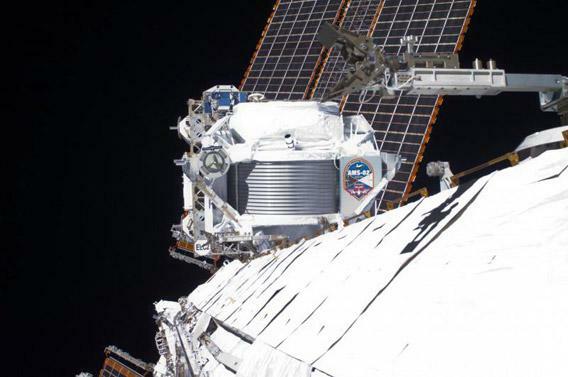 Dark matter: Experiment on the space station hints at WIMPy dark matter. The Alpha Magnetic Spectrometer on board the space station. New results from an important scientific experiment aboard the International Space Station have strengthened the case for dark matter. Interestingly, too, the results point toward what dark matter might actually be—and that’s one of the biggest goals in physics right now. The experiment is called the Alpha Magnetic Spectrometer-2, and what it does is measure cosmic rays. This is a generic term given to subatomic particles that zip around the cosmos. They come from the Sun, they come from exploding stars, they come from black holes…and they may come from dark matter (more on that in just a sec). Cosmic rays can be electrons, protons, helium nuclei, even antimatter—real particles that are like matter but have an opposite charge. So an antielectron (called a positron) is exactly like an electron but has a positive charge. An antiproton (sadly, not called a negatron, though it really should be) is just like a proton but has a negative charge, and so on. 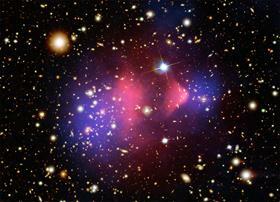 The Bullet Cluster, what many astronomers consider to be the smoking gun of evidence for dark matter. Click to enzwickynate. Image credit: X-ray: NASA/CXC/CfA/M.Markevitch et al. ; Optical: NASA/STScI; Magellan/U.Arizona/D.Clowe et al. ; Lensing Map: NASA/STScI; ESO WFI; Magellan/U.Arizona/D.Clowe et al. So all these particles are whizzing around in space, and AMS-2 measures them. It can tell what kind of particle hits it, and how much energy it has, too. The energy of the particle is related to what made it, and what it’s done since that time. Some particles are made in low energy events, some in high energy events, and all of them have had to travel across space, dealing with the galaxy’s magnetic field as well. By the time it gets to Earth, the energy, direction, and type of particle all have their piece of the tale to tell. Now, we know that dark matter exists. We’ve had evidence of it for a century now, both in the movement of galaxies as they orbit each other, and the way galaxies like ours rotate. Both indicate there is way more mass in galaxies than we can see—hence the term dark matter. Since that time, lots of other independent lines of evidence point toward dark matter’s existence as well, including the newly-announced results from Planck (I’ll note there are alternative ideas to dark matter, but even the best don’t do very well to explain what we see). The maddening thing is we don’t know what it is. We know what it isn’t: rogue planets, cold gas clouds, dead stars, black holes, and such. Any of those would give away their identities in other ways. We’ve been able to eliminate all the normal types of candidates. All that’s left is some form of exotic subatomic particle. The best candidate is called a WIMP, for weakly interacting massive particle. A WIMP is a weird form of matter that doesn’t interact well with normal matter (which is why it’s hard to detect) but still has some mass. Over cosmic distances, the amount of this stuff adds up to give us the effects we see from dark matter. One property of WIMPs is that if they come in contact with each other, they explode into energy and simpler subatomic particles (this process is called self-annihilation). It’s similar to what happens if an electron and positron come in contact. Bang! They turn into energy, à la E=mc2. In the case of WIMPs, through some complicated subatomic processes, one of the results is the creation of electrons and positrons. AMS-2 is designed to look for all this. In its first 18 months of operation, it detected 25 billion cosmic ray events, about seven million of which where electrons and positrons. After sifting through all that, what it found was intriguing: an excess of positrons over what is expected from background radiation (the amount we expect to see from other, more normal sources). This has been seen before in previous experiments, but not to the accuracy AMS-2 has seen. The excess fraction of positrons seen versus the energy of the particles. The data fit well with—but don’t yet confirm—the idea that dark matter is WIMPy. This is very close to what’s predicted for dark matter WIMPs. That’s exciting! But it’s not conclusive. It could still be due to some other source, like pulsars—rapidly rotating super-dense balls of neutrons created when massive stars explode. These create particles furiously, and the signal is very much like that of WIMPs. The good news is AMS-2 is not finished yet. These new results are milestone markers, not the final product. Over the next few years more and more data will be collected, and each positron seen adds to the total, making the data cleaner. Eventually, it’s hoped, the detections will be so accurate we’ll be able to say for sure whether these extra positrons are from dark matter or not. In the meantime, other searches continue. The Large Hadron Collider in Geneva can also look for dark matter, and preparations have begun to improve its ability to do so. Other experiments are working toward this goal as well. So I’m excited but cautious about this announcement. 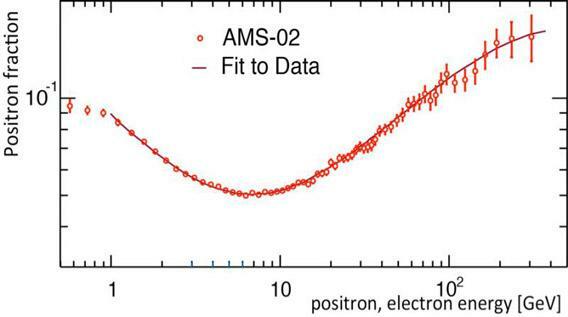 It shows pretty clearly the positron excess is real, and shows quite well that AMS-2 is up to the task of looking for dark matter. I’m glad to hear it; AMS-2 has something of an, um, interesting history (see the bottom of this article for more, as well as an article I wrote when AMS-2 was approved for flight) so at least now we can be glad it can do the job it was built to do. And it shows once again that we stand at an amazing point in history, where we can for the first time take the measure of the Universe and truly understand its mechanisms. The overwhelming majority of the Universe is invisible to our eyes, so we have to build machines as proxies to look for us. But those are just extensions of ourselves, so really it’s through our own imagination and curiosity that we query the Universe, and it’s through science that we get the answers.